Sd Cards are a popular storage device for Mobile Phones and Digital Cameras. They come with limited capacity and hence getting full really easily. In such cases, you need to transfer the photos to another location and delete the ones you don’t want. In this process, you can accidentally end up deleting some important photos. If something like this has happened, or if you have lost your photos for some other reasons, you can use the following tools to recover the photos from your SD card or you can also take the help of some hard disk data Recovery or some data recovery computer services. You can recover lost photos irrespective of the reasons they were lost. For 100% success in recovering photos, it provides two different ways of recovery. If you have formatted SD files accidentally, you can restore them as well. If your SD card is defective or unreadable, or it has suffered formatted damage, you can recover photos in these conditions as well. You can preview images before recovering. Un-deletion of files, including pictures. 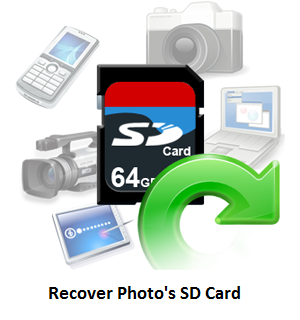 Recovery of photos and other files from a damaged, formatted or corrupt SD card and other disks. It offers a detailed scan facility. You can also use inbuilt quick-start wizard for recovering photos and other files right away without going through the options. It also comes in a portable version and with an extremely user-friendly interface. It recovers many different file types including photos. This works best in recovering photos from a corrupt SD card. It is a read-only data recovery program making it safer to use. It can work both in Windows and Mac. Compatible with almost every kind of storage devices. It can recover a wide variety of files types, including photos with added options. It supports many file types, including photos and even emails. Multiple scanning methods- Quick scan for deleted photos and deep scan for formatted, inaccessible and lost photos. You can also see the preview of the recovered photos before restoring them. The scans are saved for the future use. These are just 5 top tools for recovering your photos from your SD card. The market is flooded with such data recovery services and tools that you can use. You must always pick a tool that is credible and secure and feels easiest for you to use. Don’t just use the one that’s free or cheap. Taking the backup time and often is a good way to keep your photos and other data safe.